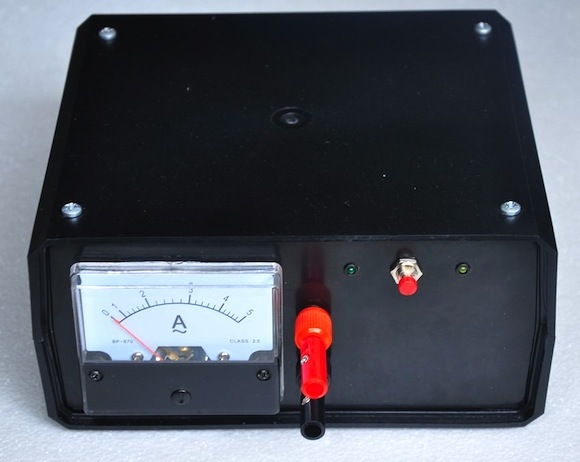 Here’s an Instructable about a DIY charger for car’s battery with an analog DC ammeter in the front panel. A PIC12F683-based control circuit is enclosed inside which adds some intelligence to this charger. 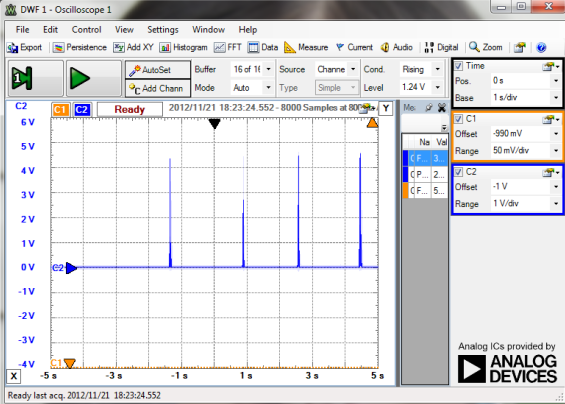 The PIC MCU checks the terminal voltage of the battery being charged in every ten minutes using one of its analog inputs, and if it is found above a set threshold, the charging process is stopped. A relay switch is included into the circuit to connect/disconnect the charger output and the battery terminals. My two and a half year old son loves toys with flashing lights. For this Christmas I thought of making a mini LED Christmas tree for him. 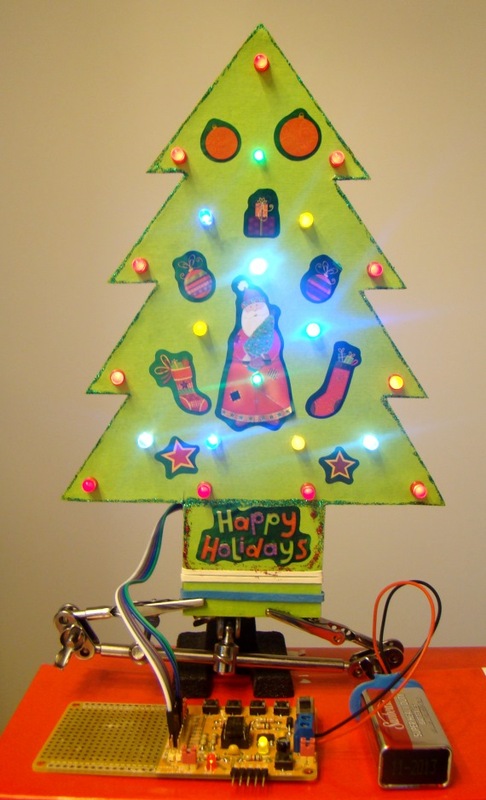 This project uses 22 multi-color LEDs which are driven by a PIC12F683 microcontroller using the Charlieplexing technique. The details of the build procedure is described in the following sections. The 12F series of PIC microcontrollers are handy little 8-pin devices designed for small embedded applications that do not require too many I/O resources, and where small size is advantageous. These applications include a wide range of everyday products such as hair dryers, electric toothbrushes, rice cookers, vacuum cleaners, coffee makers, and blenders. Despite their small size, the PIC12F series microcontrollers offer many advanced features including wide operating voltage, internal programmable oscillator, 4 channels of 10-bit ADC, on-board EEPROM memory, on-chip voltage reference, multiple communication peripherals (UART, SPI, and I2C), PWM, and more. 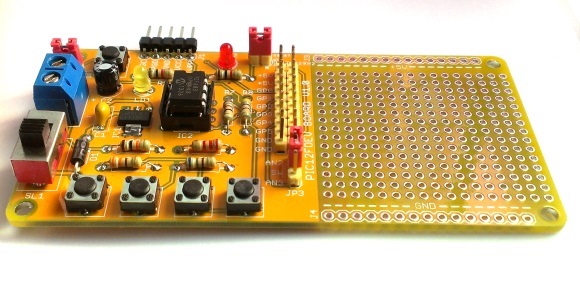 Today we are introducing a new development board (rapidPIC-08 V1.0) for easy and rapid prototyping of standalone applications using PIC12F microcontrollers. 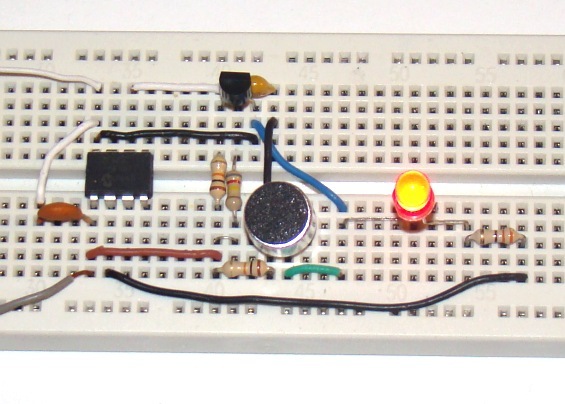 A clap switch is a fun project for beginners. It switches on and off electrical appliances with a sound of clapping hands. Today we will discuss about making a simple clap switch that operates when it detects two clapping sounds in a row. It uses an electret microphone as a transducer for converting a clapping sound into an electrical signal. The microcphone output is amplified by a transistor and is then sent to the PIC12F683 microcontroller which performs an ON/OFF switching action when valid claps are detected. 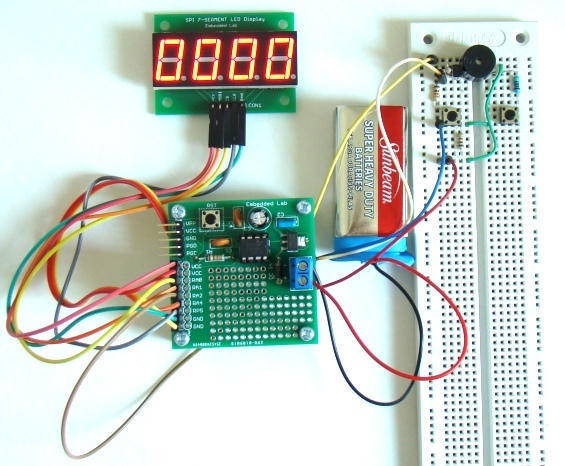 The goal of this project is to construct a simple 0-9999 seconds count down timer with an alarm and a display. 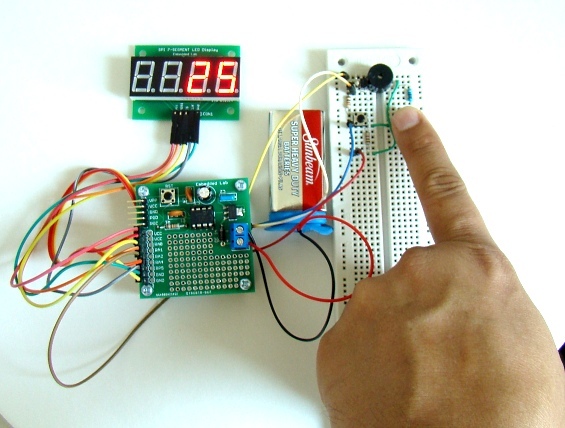 The time is set through two tact switches and the count down seconds are displayed on a 4-digit seven segment LED display. 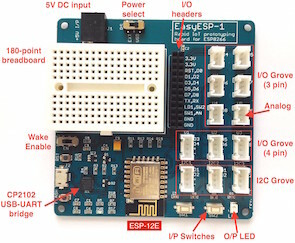 The project uses PIC12F683 microcontroller for all I/O and timing operations and MAX7219 IC for driving the seven segment LED module. The time out condition is indicated by an audible alarm from a buzzer.